Jussie Smollett says he is "OK" and is working with police after reporting to them that he was assaulted in Chicago, marking his first public comments about the incident. On Tuesday, police said they were investigating a "possible racially motivated" attack on the 36-year-old Empire actor. They said two unknown assailants allegedly approached him, yelled racial and homophobic slurs, hit him in the face, poured an unknown chemical substance on him and wrapped a rope around his neck before fleeing the scene. Smollett traveled on his own to a hospital and was said to be in good condition. "Let me start by saying that I'm OK," Smollett said in a statement to E! News on Friday. "My body is strong but my soul is stronger. More importantly I want to say thank you. The outpouring of love and support from my village has meant more than I will ever be able to truly put into words." News of the incident went viral and drew mixed reactions nationwide; many expressed outrage and sympathy, while others dismissed the news as a hoax. "I am working with authorities and have been 100 percent factual and consistent on every level," Smollett said in his statement, which was first obtained by Essence. "Despite my frustrations and deep concern with certain inaccuracies and misrepresentations that have been spread, I still believe that justice will be served." Donald Trump Calls Jussie Smollett Attack "Horrible"
Investigators have recovered surveillance video showing two "potential persons of interest" allegedly involved in the reported attack, and possible hate crime. They have also recovered surveillance footage of Smollett walking in downtown Chicago before and after the incident, including video of him arriving home with a rope around his neck, reports say. Chicago police spokesman Anthony Guglielmi said on Thursday that Smollett and his manager told detectives they were speaking to each other on the phone at the time of the attack. The actor has refused to turn over his cellphone to police, but his team has offered to share his phone records, which would show he and his manager were speaking at the time of the assault, a source told E! News. Guglielmi told Reuters that police had "no reason to doubt" the accounts of both Smollett and his manager that they were on the phone together at that time. 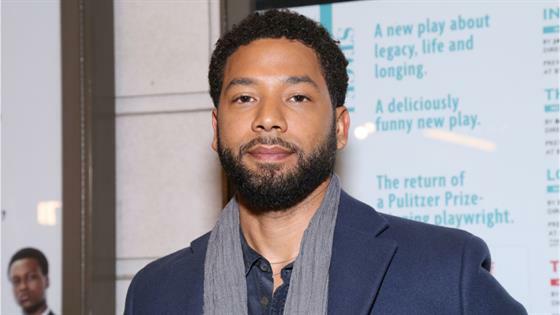 Also on Thursday, Smollett's family said in a statement, "Our beloved son and brother, Jussie, was the victim of a violent and unprovoked attack. We want to be clear, this was a racial and homophobic hate crime." The statement added that Smollett had "told the police everything" and that "his story has never changed." The family also noted in their statement that they wanted "people to understand these targeted hate crimes are happening to our sisters, brothers and our gender non-conforming siblings, many who reside within the intersection of multiple identities, on a monthly, weekly, and sometimes even daily basis all across our country." "As my family stated, these types of cowardly attacks are happening to my sisters, brothers and non-gender conforming siblings daily," Smollett said in his statement on Friday. "I am not and should not be looked upon as an isolated incident. We will talk soon and I will address all details of this horrific incident, but I need a moment to process. Most importantly, during times of trauma, grief and pain, there is still a responsibility to lead with love. It's all I know. And that can't be kicked out of me."